Click the Menus link in the Appearance menu on your Dashboard. 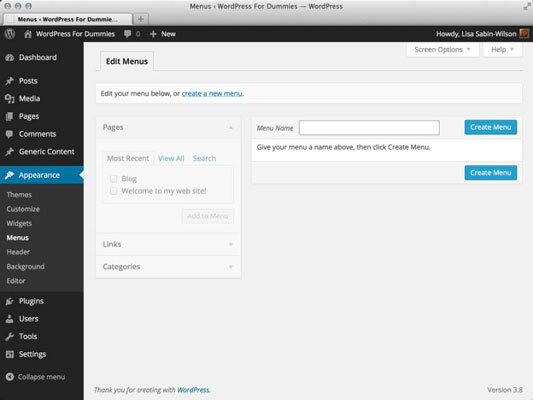 The Menus page opens on your WordPress Dashboard. Type a name in the Menu Name box and click the Create Menu button. The Menus page is reloaded with a message that tells you your new menu has been created. Add links to your newly created menu. Pages: Click the View All link to display a list of all the page(s) you have published on your site. Select the box next to the page names you want to add to your menu. Then click the Add to Menu button. Links: In the URL field, type the URL of the website that you want to add (https://www.google.com). Next, type the name of the link that you want displayed in your menu in the Label text field (Google). Then click the Add to Menu button. Categories: Click the View All link to display a list of all the categories you’ve created on your site. Select the box next to the category names you want to add to the menu. Then click the Add to Menu button. Review your menu choices on the right side of the page. When you add new menu items, the column on the right side of the Menus page populates with your menu choices. Edit your menu choices, if needed. Click the Edit link to the right of the menu link name () to edit the information of each individual link in your new menu. Save your menu before leaving the Menus page. Be sure to click the Save Menu button under Menu Settings on the right side at the top of the Menus page. A message appears, confirming that the new menu has been saved. You can create as many menus as you need to for your website. Just follow the parameters for the menu template tag to make sure you’re pulling in the correct menu in the correct spot on your theme. Pay attention to either the menu ID or menu name in the template tag. You find more options for your navigation menus by clicking the Screen Options tab at the top-right corner of your Dashboard. From there, you can add things like Posts and Custom Post Types to your menu options, as well as add descriptions for menu items. Notice in the HTML markup that the first line defines CSS ID and class: <ul id=“menu-main” class=“menu”>. The ID in that line reflects the name that you gave your menu. If you named it “Foo,” the ID would instead be menu-foo. This assignment of menu names in the CSS and HTML markup is why WordPress allows you to use CSS to create different styles and formats for your different menus. When developing themes for yourself or others to use, you want to make sure that the CSS you define for the menus can do things like account for subpages by creating drop-down menu effects. You can do this several different ways, and here is just one example of a block of CSS that you can use to create a nice style for your menu (this CSS example assumes that you have a menu named “Main”; therefore, the HTML and CSS markup indicate ‘menu-main’). The CSS you use to customize the display of your menus will differ. After you get the hang of using CSS, you can try different methods, colors, and styling to create a custom look of your own.